Congratulations to the Leduc Composite High School Team GOLD Champions of the 2013 Provincial Skills Competition–Robots. 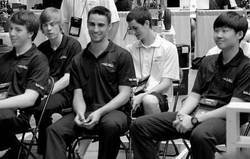 Shown here dressed in the black Team Alberta uniform, the young men proudly represented Team Alberta at the National Skills Competition in Vancouver on June 6 and 7th. In this photo, the team is receiving last minute instructions before the contest. Seated (L to R): Josh Mulder, Kurk Urvold, Timurlane Cakmak, and Rae Jeong. Photo submitted by Dennis Cebuliak. Two outstanding teams from Leduc Composite High School were awarded top medals at the Provincial Skills Competition—Robotics category held in Edmonton on May 15 and 16, 2013. The Silver medal team members are Captain Ethan Howald, Raine Gingras, Matt Myers, and Terran Station. The Gold Champions are Josh Mulder, Kurk Urvold, Timurlane Cakmak, and Rae Jeong. The robots are part of a program called Computer Science Education (CSE). However, next year LCHS hopes to expand it to include just robotics. Leduc Comp IA Instructor Dennis Cebuliak said he has been running the program for almost two years. While there are currently no formal plans to give the students advanced course credit, any experience in programming and robotics will certainly give the student an advantage at the college and university level. Next year, these students will be going on to NAIT and various universities to study engineering, logistics, mechatronics (in Waterloo), and even animation. Team Alberta had some very strong support from several parents, friends, teachers, and mentors. Special mention goes to Mr. Greg Loose, Mr. Merv Sykes.